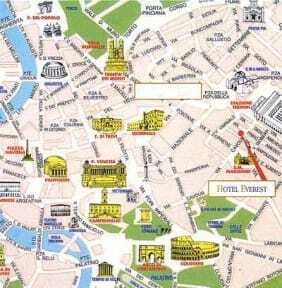 Hotel Everest is a short walk ( 2 min) from Termini station. Situated just besides the historical church Santa Maria Maggiore build in the 5 century AD, on via Cavour which leads directly to the Colosseo. All the major sights such as Santa Maria Maggiore, Colosseum, Piazza Venezia, Piazza Della Repubblica, San Pirtro in Vincoli Church the National Museum etc..are within walking distance as well the main shopping areas. The ideal location and the hotel can be enjoyed by all types of travellers. From the hotel you can take all means of transportation the subway, the bus or the taxi and can reach at any part of the city, also at night. The hotel is on the third floor of a building and can be reached by an elevator. 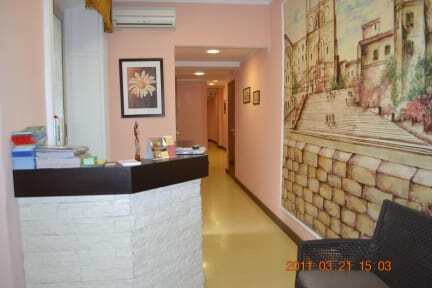 The reception which is open 24 hrs you will meet friendly and helpful multilingual staff. The hotel is often renovated to provide you with clean, tidy and well furnished rooms, designed to give all the comforts. All our rooms have private bathroom, shower, hairdryer, mini-bar, Safe,Flat screen TV, heating / air condition centralized and direct telephone. Nearby to our hotel is a private car park (approx 16 euro for 24 hours). metro stops, main bus stand, taxi stands, restaurants, supermarket, pharmacy, international calling center, banks, money-exchange offices, and bars all around the corner from the hotel!! Complementary : Towels, shampoo and soap, per person. Free : City map with tour information. National landline calls and fax. Note : To avoid any inconvenience please inform us your check-in time. The hotel reception service is from 08:00 till 20:00 but we have 24 hrs check-in and check-out service. You can leave your bags at the hotel if you arrive before the check-in time and even after check-out. * In case the reservation has to be cancelled / modified it has to be done 3 days before (72 hours) from the arrival date of the reservation or there will be a cancellation fee,which is the cost of the room for 1 night.After Check-in the reservation can not be cancelled or modified. In the event of a NO-SHOW the hotel will charge all the nights in the booking on the customer's credit card. * When you book a double room its not possible to have two separate beds. * City tax not included, cost euro 3 per person per night. * Smoking is strictly prohibited in all guest room and within the hotel premises. * Animals are not accepted in the hotel. Gute Lage nur ein paar 100 m vom Bahnhof Rom entfernt. Die Innenstadt ist gut zu Fuß erreichbar. Sehr nettes Personal! Zweckmäßige Ausstattung. Gepäckaufbewahrung hat super geklappt. Gerne wieder.